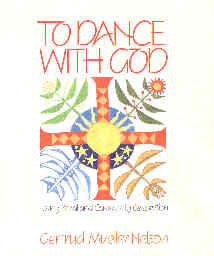 The title of the book come from Gertrud's 4 year old daughter's mouth when she was asked why she was making a banner - "I'm going to have a parade so that God will come down and dance with me." From that seed the structure for this book grew inside her. In the early chapters she presents the essentials of ritual: in particular, the answer to "why bother?" Her answer comes from the Pantheon (all-gods) in Rome. The dome was constructed by filling the vault with dirt (with occasional coins scattered throughout), building a dome over the dirt, and then excavating the dirt (the coins were incentives to the excavators- may be the origin of the word "in-cent-ive"). At the peak of the dome a group of statues of Roman gods were placed. Over time the statues fell through the dome leaving a gaping hole -the hole through which the gods came to earth. In medieval times on Pentecost the Christians would drop burning straw through the Holy Ghost Hole and release a white dove signifying the entry of God into the realm of mankind.